Both sides of the aisle -- and even the former Eli Lilly exec himself -- expressed concerns over the ballooning drug prices and stressed the need to make pharmaceuticals more affordable. Former Eli Lilly exec Alex Azar, President Donald Trump’s nominee to replace the ousted U.S. Department of Health and Human Services’ Secretary Tom Price, told the Senate HELP confirmation hearing Wednesday morning that his top priority was to make prescription drugs more affordable. To Azar, the crux of the issue is drug manufacturers gaming the system and a need for competition that can be fueled by the use of generic drug offerings. The point was continually reiterated and examined throughout the hearing on both sides of the aisle, and for most senators Azar’s answers were satisfactory. Most Republicans touted Azar’s successful experience in both the government and private sectors. But Azar drew some skeptical questioning from many Democrats -- and even Sen. Rand Paul, R-Kentucky. Rand laid into Azar about his opposition to consumers importing lower-cost drugs from other countries from the EU and other countries. He also supports the use of drug rebates, but didn’t explain any possible constraints on list pricing set by pharmaceutical companies. Drug pricing would be just one of Azar’s four priorities as secretary, also included were fighting the opioid epidemic, combating overpriced healthcare and ensuring all Americans have access to affordable, quality healthcare. Another recurring topic? Women’s healthcare. Murray, Sen. Al Franken, D-Minnesota, and Sen. Elizabeth Warren, D-Massachusetts -- to name a few -- grilled Azar on his “conscience exemption” stance, which lets organizations opt out of some healthcare services for women -- including abortion and contraceptives. As only “about 200 employers” fall into this category, Azar said the impact would be minimal. And the administration has created a balance between the ethical objections posed by some organizations and making sure women have access to affordable contraceptives. But Warren felt Azar’s responses were far too similar to Tom Price -- who was pressured to resign in September during an investigation into his use of private planes for official business -- on the taxpayers’ dime. 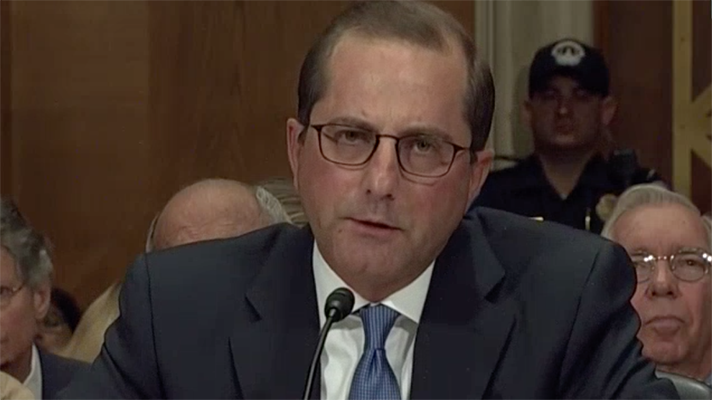 Azar was general counsel for HHS from 2001 to 2005 and was deputy secretary for two years. The Senate confirmed these positions. He followed his tenures at Eli Lilly, and resigned from the position of President of Lilly USA in 2012. If confirmed, Azar will be the first HHS Secretary to come from the pharmaceutical industry.